THIS ^^^^^^ IS THE MOST IMPORTANT VIDEO IN MY A TO Z CHALLENGE! I’m going to share, once again, my favorite quotes by Brene in this video. Where did we pick up the message that we’re not worthy ~ that we’re not enough. We each have to look at our own lives and find the answers to that. I like how she extends this into our politics and our religions. Whole-hearted people have a sense of courage… the courage to be imperfect…. the compassion to be kind to themselves first and then to others. They had connection as a result of their authenticity. Vulnerability is kind of the core of shame and fear and our struggle for worthiness, but it appears it’s also the birthplace of joy, of creativity, of belonging and of love. This is what politics looks like today. There’s no discourse. There’s no conversation. There’s just blame. You’re imperfect . . . and you are wired for struggle but you are worthy of love and belonging. My way of dealing with pain and vulnerability was to stuff it down and leave it unexpressed until I had to take the time to bring it all into the open and talk about it and deal with the pain. We need to tell our stories and to share them with others who will be inspired to do the same. A tender illustrated fable of what happens when we deny our difficult emotions. A gentle reminder of what we stand to lose when we lock away loss. Beautiful thoughts here. I agree about learning/accepting vulnerability into your life. I need to remember it’s a good thing more often than I do. As “we” go through this wonderful and creative challenge with you, Mary Lou, and with four letters left, what comes to mind is the song (I am not sure of the exact name) that ends with: “It’s fun to go through, the alphabet with you, and find out what you mean to me” (or something like that). 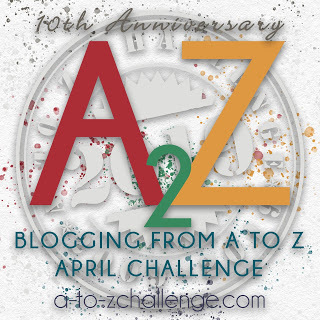 This AtoZChallenge has been that kind of journey for me, Leanne! Very rewarding. 🙂 Thank you! Very nice post with Brene Brown!! That makes 3 of us who are big fans of her work! 😉 You, Sneha and myself. Thank you Daisy! I visited your V post and agree with you that a person who bullies and abuses animals will also bully and abuse people. We need to act when we witness this.